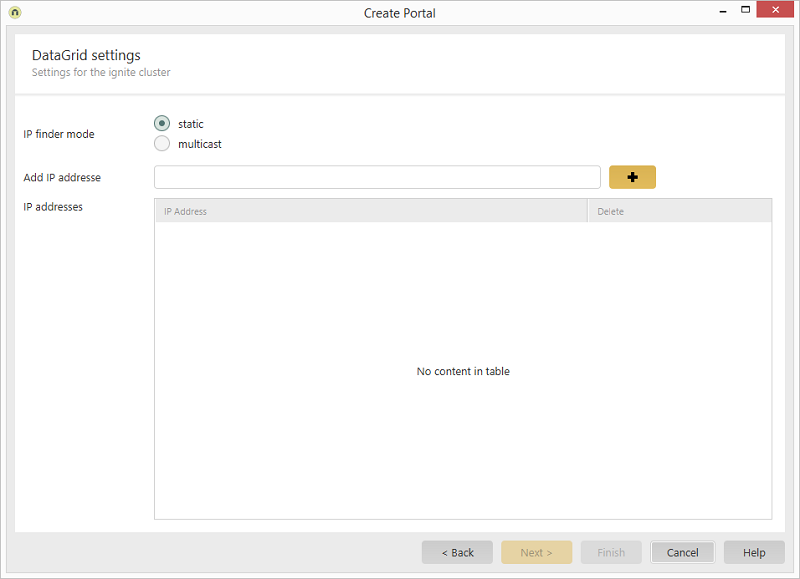 Start module Create a new portal General settings / Click on "Next" and continue to "DataGrid settings"
Start module File menu / New portal General settings / Click on "Next" and continue to "DataGrid settings"
Portal menu / Import portal General settings / Click on "Next" and continue to "DataGrid settings"
Portal Builder General settings / Click on "Next" and continue to "DataGrid settings"
This dialog is only shown for a Intrexx Portal Server Production Installation (Cloud / Cluster). The IP addresses specified here are required for finding the individual Intrexx server instances. With this option, a multicast IPv4 address will be requested. With this option, instances can use a shared directory to form a cluster. Enter your IP address here. Adds the specified address to the list of IP addresses. Displays the specified IP address. Deletes the currently selected IP address from the list.